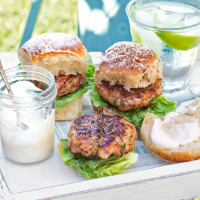 If you don’t have a food processor, use pork mince instead of shoulder for these delicious burgers. You could also make 16 mini sliders with this recipe. 1. Put the lardons or pancetta in a frying pan with the onion; heat gently. Cook for 8-10 minutes, stirring occasionally, until the onion has softened. Transfer to a mixing bowl and leave to cool completely. 2. Mince the pork shoulder in a food processor. Squeeze the meat out of the sausages; discard the skins. Add both meats to the pancetta and onions with the remaining ingredients; season and mix well. 3. Shape into 150g burgers and cook on a hot barbecue for 5-10 minutes on each side, until cooked through and piping hot. Serve in rolls with lettuce and mayonnaise, if liked.